Douglas, Arizona is a town of nearly 17,000 on the U.S.-Mexico border. Like other border communities, it faces the challenges of limited resources, a dying mining industry, and stigmas associated with drug trafficking and related violence. 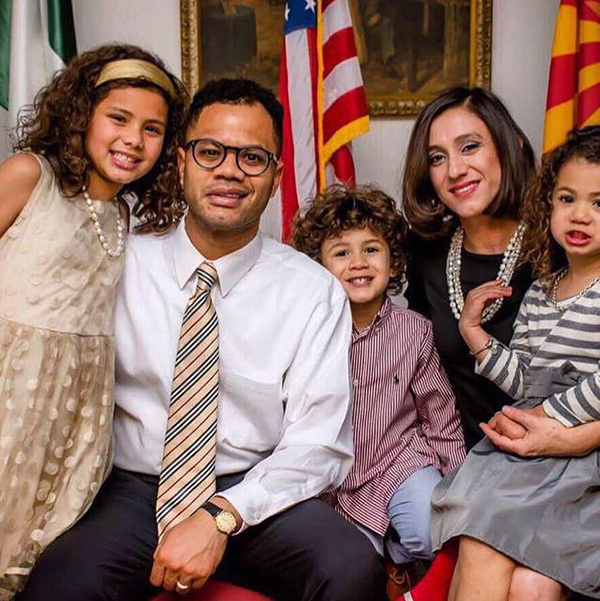 The town’s mayor, Robert Uribe, 32, is the youngest and only Afro-Latino to ever serve in the role. Born in the Dominican Republic, he immigrated to the United States with his mother and brother and became a U.S. citizen at age 13. 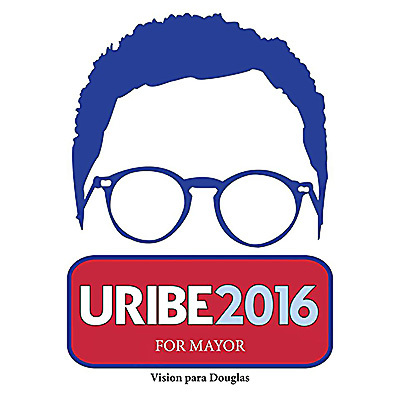 In 2010, Uribe met the Douglas-born artist Jenea Sanchez and the two were married. He followed her to Douglas in 2012 and was elected mayor in 2016. 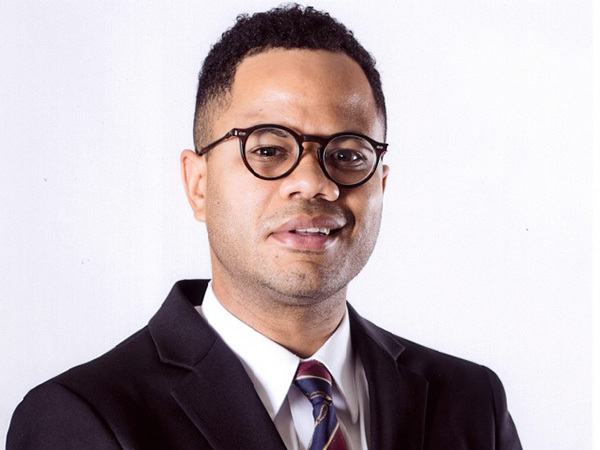 Uribe spoke with Borderlore about his mayoral hopes, re-imagining the town’s narrative, and the role of arts and culture in civic pride and revitalization. BorderLore: Why did you decide to seek public office? Robert Uribe: There’s something special and unique about Douglas. The people here are absolutely lovely. Once [my wife and I] opened our café in 2012, we immersed ourselves in the community. We started sponsoring sports and we heavily promoted the arts through our cafe. I met many different people and was fortunate enough to hear about some of the most important issues the city was facing and I put together some ideas on how to address them. I wanted to demonstrate the importance of being someone who was part of reshaping Douglas, rather than someone who was complaining. It’s amazing how things work out. A few months before I decided to run for mayor, I went on a trip to Chiapas, Mexico to meet the farmers from Cafe Justo, which is the coffee we serve in our shop. The former mayor of Douglas attended that trip. He wasn’t sure he wanted to run for mayor again and we had a casual conversation about it. We came back to the states and the mayor confirmed that he wasn’t going to run. He laid out a great platform for Douglas to continue on a track to progress economically and culturally. I was motivated upon my return from Mexico and felt that I was the person for the job. I thought, Let’s see what happens. And here I am. Sometimes I think, “Oh my gosh! I’m the mayor of a border community.” But people have embraced my family and me, and I’m humbled to serve the greatest border community in the country. BL: Can you talk about your childhood, your life before Douglas? RU: I was born in the Dominican Republic. I grew up in New York City. I became U.S. citizen thanks to my mother in 1997. My mom was an immigrant and she didn’t have the greatest education, but she made sure to expose my brother and I to art, culture, music, and fashion — those were her areas. We lived in a tough neighborhood. She wanted us to experience the many areas of NYC. There was Fifth Avenue, there was MOMA, there was the Statue of Liberty. My mom had a vision. Normally someone from a foreign country is intimidated by the big city. But my mom, my brother, and I would hop on the train, explore the different boroughs, meet new people in transit. We moved to Arizona in 2005. She didn’t want us to become a statistic. I didn’t get into trouble, but you know, young Latinos incarcerated in New York City, that repeated cycle, no growth. She had such a creative way of seeing the world. After God, I’m so humbled and honored to have such a strong mother, with that vision. She has had such a positive influences on the lives of my brother and me. When we landed here in Arizona, the economy was booming. We lived in Chandler. I never imagined I’d have so many opportunities available to me. I worked in various jobs — at the University of Phoenix, Phoenix Country Day School, United States Census. I was very active and had access to so many amazing opportunities. BL: How did you end up in Douglas, Arizona? RU: In 2010, I met Jenea Sanchez, my wife. She’s from Douglas. She was finishing her degree in art. She and I have always had a collaborative relationship, especially when it came to creative and entrepreneurial projects. We had an online boutique selling vintage clothes all over the world. After Jenea finished her degree she found several teaching opportunities in Douglas and we decided to make the move. There are so many important women in my life. Jenea educated me about life on the border. As much as someone tries to explain it to you, it’s nothing like living on the border. When I moved to Douglas I was like, Whoa! The resources and amenities are so limited. But the people were captivating, their willingness to know you and help you. We were passionate about downtown. I always remember what my mom showed me in the 1990s, that rich history of New York City. I saw the potential of Douglas, it reminded by of the good days in New York. In 2012, we opened the first coffee shop in Douglas, Galiano’s Café on G Avenue. I felt privileged. This could never happen in New York City. You have to have a lot of capital there. Here was this opportunity to be an entrepreneur in a historical downtown district. We ended up buying the building. Our goal was to use our cafe as a place for artists to take ownership. A place they could celebrate their work and cultivate new ideas. We have an expanded set of goals for our building. But some of them are on hold, because I have a new job. But that was what motivated my wife and I to develop the vision for Douglas. BL: What are some of your current mayoral challenges? RU: I’ve tackled my job like a beast. I want to master it like I mastered the fundamentals of basketball. What I’ve noticed is just the limited amount of resources available to communities like ours. This is a border town. There’s definitely a narrative that gets played out. Drug trafficking, human trafficking, illegal immigration, all of that. People will say, “Yeah, I haven’t been there in a long time.” My goal is to change that, to change the narrative about our city and focus on the beautiful nature of living on the border and the bi-national experience unique to our region. The way I see it is that we’re at a disadvantage every time Douglas is mentioned for illegal activities at the border, but we have an opportunity to change that around. We can utilize social media to send out a different message, and we’re diligently pursuing that. There’s a perfect opportunity for our city to tell our side of the story. To the skeptics, I say, “Look at us.” We are attracting people. We are focusing on socioeconomic growth and development in Douglas, that’s the vision. It’s not an overnight fix. It extends decades into the future. The fact that I am a young mayor in a border community has sparked a conversation — at least that’s how others have described it to me. It’s a different energy and movement. BL: How do you see art and culture as catalyst of change for Douglas? RU: My wife and I are both artists so our approach in reshaping Douglas’ future had partly been influenced by our experiences as artist and cultural workers. 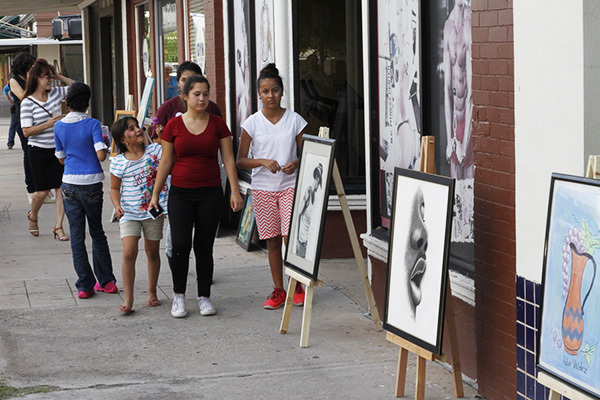 We formed the Border Arts Corridor (BAC) as a way to build bridges through art and cultural programming. We started bi-national artwalk and have hosted residencies and dialogues. 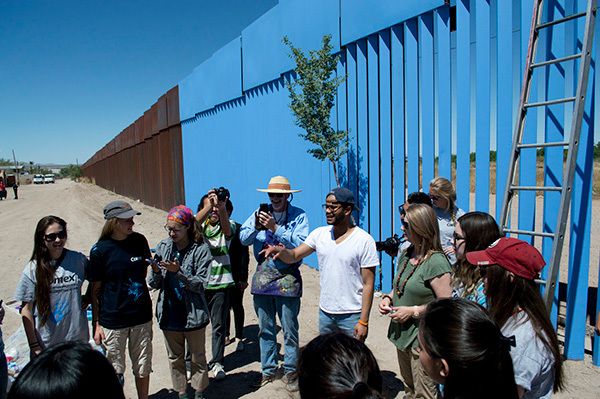 We work closely with the cultural organizations in Agua Prieta, Sonora, and have collaborated with institutions all across Arizona in bringing distinguished artists and scholars to our border cities. Recently our city council and I voted to designate G Avenue as the Art and Cultural District. This is a huge step forward. Now we have a foundation to build from. In February, the City of Douglas produced a jazz concert to celebrate Black History Month. It was the first time that Black History Month had been celebrated in this way in Douglas. I learned that over 2,000 African Americans and Buffalo Soldiers resided here at one time. So it was monumental to have a concert here in front of the Gadsden Hotel to acknowledge this part of our history and to show that were are a diverse community. The sounds. It was just beautiful, and we hope to do it again next year. We’re going through an interesting time. I had a conversation about politics with a Trump supporter at the Jazz Festival. But what was so great about this interaction was that there was the sound of music in the air. At the end of conversation, the man told me, “Regardless of where we stand politically, if you were my congressional person I would work with you.” Music, art, culture — these things bring us together to have a real conversation. It’s very different from conversations that happen behind computer keyboards, where we can hide and not be accountable. We’re living in a divisive political moment. President Trump has proposed building a wall along the US-Mexican border and there is a growing anti-immigrant sentiment. Do you see your position as symbolic in any way? I’m 100 percent against the proposed border wall. We should be using those funds for infrastructure within border communities — on roads, education, programs for our kids. If we could use even a fraction of the money being proposed for the wall on those things, we could turn these communities around. We live at a port of entry, where trade happens daily, and we haven’t been able to improve our infrastructure to accommodate the bi-national commerce in years. And here we are wanting to build a giant wall? It’s troubling. Robert Uribe speaking at the border wall. We are living a time when we need more unity not division. I pray and hope that our president provides more peace and unity. This is the greatest country in the world, and I’m proud to be living in the United States. I remember how much we struggled as immigrants not knowing the language, my mom on welfare, my mom a single mother. I was here as a permanent resident. My mom knew the importance of becoming a U.S. citizen. This is where she wanted us to be. Many generalize immigrants as bad people. When we have this aggressive anti immigration rhetoric, it hurts. Because we’re not all bad people. BL: Who are your allies? RU: Anyone who wants to have a conversation with me. I am not exclusively available to certain people. I’ve made it a point to put myself out there to the public, to my constituents. I want to hear from you. If you think I shouldn’t be against the wall, talk to me. I’ll listen. My allies are everyone here in the City of Douglas.